Paul is passionate about young people, the environment and leadership nexuses. He is driven by biodiversity conservation, indigenous communities and people livelihoods agendas. Paul is currently in his final year his Master of Environmental Sciences program at Kenyatta University, Kenya. 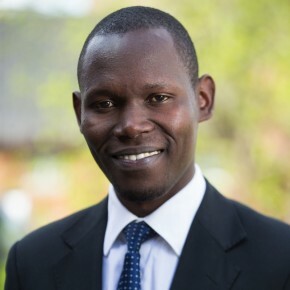 His research project focuses on developing a functional Water Evaluation And Planning tool (WEAP) for the simulation of water resource use and allocation scenarios in Nyangores Sub-catchment, Bomet County – Kenya. Once complete, the model will assist the county government in policy decisions and proper planning and management of the Upper Mara River basin headwaters of Nyangores. He juggles his studies with his ongoing environmental conservation work with communities living at one of the largest water towers in Kenya, the Mau Forest. The goal is to protect the upper catchment of the greater Masai Mara and Serengeti ecosystems lying downstream of the water tower. These two ecosystems boast of the annual Great Wildebeest Migration, which is a UNESCO World Heritage event. Paul has secured funding for a one-year project that seeks to enable indigenous communities upstream to practice water catchment recharge and water conversion mechanisms that are sensitive to the impact of climate change as well as to the needs of the livelihoods of local communities. This is expected to reduce or eliminate water resource conflict among upstream and downstream communities as well conflicts involving communities and wildlife. See Integrated Indigenous Knowledge-Based Approaches for the Conservation of Nyangores Sub-Catchment of the Upper Mara River Basin for the March 2015 progress report. In addition, Paul has been a regular adjunct with the Canadian field studies in Africa (CSSIA) run by McGill University. Paul obtained his B.Sc. in Range Management from the University of Nairobi and holds a Certificate in International Transboundary Water Management from the Swedish International Water Institute. Paul developed a youth engagement model and guidelines for combining environmental conservation with entrepreneurial development. The guidelines collate best practices for youth engagement from organizations across Canada and the USA. During his Sauvé year, he discovered a particular interest in – and aptitude for – public speaking. He held leadership forums and spoke at various venues, including a joint presentation with Stéphanie Jensen-Cormier on “China in Africa” at McGill University’s Sustainable Businesses Conference. Paul developed a youth engagement model and guidelines for combining environmental conservation with entrepreneurial development . The guidelines collate best practices for youth engagement from organisations across Canada and the USA. During the Sauvé year, he discovered a particular interest in – and aptitude for – public speaking. He therefore spoke and held leadership forums at various venues including the university of McGill, University of Concordia, St. Johnsbury Academy, The Shelburne Farms, Khanawake Survival School, and Dawson College. In May 2015, Paul returned to Sauvé House to participate in Sauvé Encore! 2015, as part of the Foundation’s alumni outreach program.